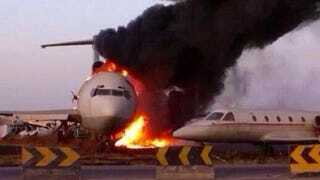 A Boeing 727 has been hit by a rocket that was supposedly aimed for the control tower at Tripoli airport. As reported on Twitter, the plane was empty at the time, but the attack on the airport continues. Updates to this story will be made as more information comes to light. UPDATE: It appears the tower has now been hit as well. Reuters reports that rival militias have been fighting to control the airport since Sunday.